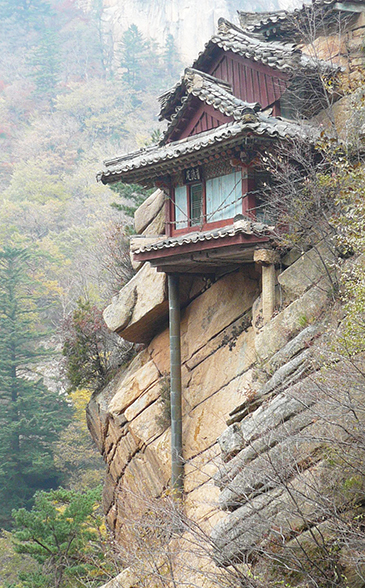 Nestled in Manpokdong Valley in Inner Geumgang Mountain (Diamond Mountain) in North Korea, Bodeokam (普德庵) or small Buddhist grotto temple hangs on the steep cliff, supported by only a lone copper pillar. Experts say that the Buddhist grotto temple showcases the architectural beauty of the traditional roof style of the Korean construction. The nine-meter-long pilar coated by copper prevents the pillar from decaying. Underneath the cliffs crystal-clear water runs through Manpokdong Valley stream. The tiny Buddhist building was actually constructed to protect the grotto to protect from the rain and snow, so that the monks can practice Zen even in the winter. The Bodeokam was originally built in 627 by a Buddhist monk Bodeok (普德) in the ear of Goryo Dynasty (936-1392). The existing building was rebuilt in 1675 during Jeocheon Dynasty, but was restored again in 1808. The pillar was originally made out of wood, but records says that it was coated by the copper in 1511. The Bodeokam (普德庵) was designated as the national treasure No. 39 by North Korea. It was visited by the late North Korean founder Kim Il-Sung in 1949. The Inner Geumgang Mountain or Naegeumgang was open to the South Korean tourists as North and South Korean relations ameliorated in the past. But it was closed as the inter-Korean ties froze over the past conservative South Korean regimes took power. Legend has it that there lived a lad practicing Zen Buddhism in this area. His name was Hoejeong. Hoejeong entered Mt. Geumgang as he wanted to study Buddhism and to practice Zen for 10 years to become a respected Buddhist. Seven years passed by. One day he was washing his face in the stream. Then he saw a feature of beautiful lady reflected over the surface of the water. He thought it was lady Bodeok he saw in his dream last night. He turned over and searched for the lady. He was shouting "Lady Bodeok!" loud and clear, but to no avail. She disappeared quickly. Hoejeong instantly fell in love with her, becoming lazy with his study. Again she appeared in his dream, scolding him about his laziness with his study. She even starting whipping him in the calf with a rod. He woke up from his dream. Thereafter he became determined again to finish his 10-year study. Howjeong entered a cave and built a shack on the cliff, living and studying Buddhism, becoming a Great Zen Master Bodeok.